You’re a G.I.R.L. (Go-getter, Innovator, Risk-taker, Leader)™. We believe there’s no such thing as too much. That there’s no excuse for making excuses. Our strength doesn’t come from how much we can lift but from how often we can lift ourselves back up. We are everyday optimists. Adventure seekers. Problem solvers. We are girls, troop leaders, mentors, advocates, parents, and Girl Scouts. 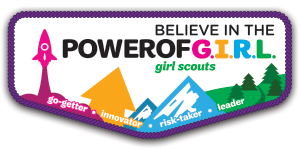 We are G.I.R.L.s (Go-getter, Innovator, Risk-taker, and Leader)™ . We will not stop. In fact, we’re just getting started. Renew today!